Guys, remember when I introduced you to this happy group back in this post? Well there was a late-breaking substitution and instead of Elle Cole (top centre right) we were joined by the lovely Nora Murphy of NoraMurphyCountryHouse.com. We all met up in High Point, North Carolina a few weeks back to take part in the Design Bloggers Tour. The tour is organized by the folks from Design Bloggers Conference (Adam, Luba and Beverly of Esteem Media) in partnership with the administrators of the High Point Market. Here's how it works: Back in the dead of winter the High Point web site posts an announcement asking for applicants for the tour. I filled out an application, hit send and then waited. In February I got the email saying I had been selected -- YAY ME! The organizers plan a two-day itinerary of showroom visits to companies that have paid to be included and for us to write about them on our various platforms. So yes, this is part of a sponsored blog series. The words and opinions contained in my posts are all my own. Most photos are mine too (exceptions are noted). This first post in my series recaps Day 1 of the tour. Grab a beverage because this day summary format means a long post with lots of scrolling, but it gives you a true sense that you are along for the tour. Check back for the Day 2 recap and then for a couple of bonus posts that I'm also cooking up. Alright, let's go. We started out in one of the main buildings called Interhall. It's a multi-storey building that houses dozens and dozens of showrooms. 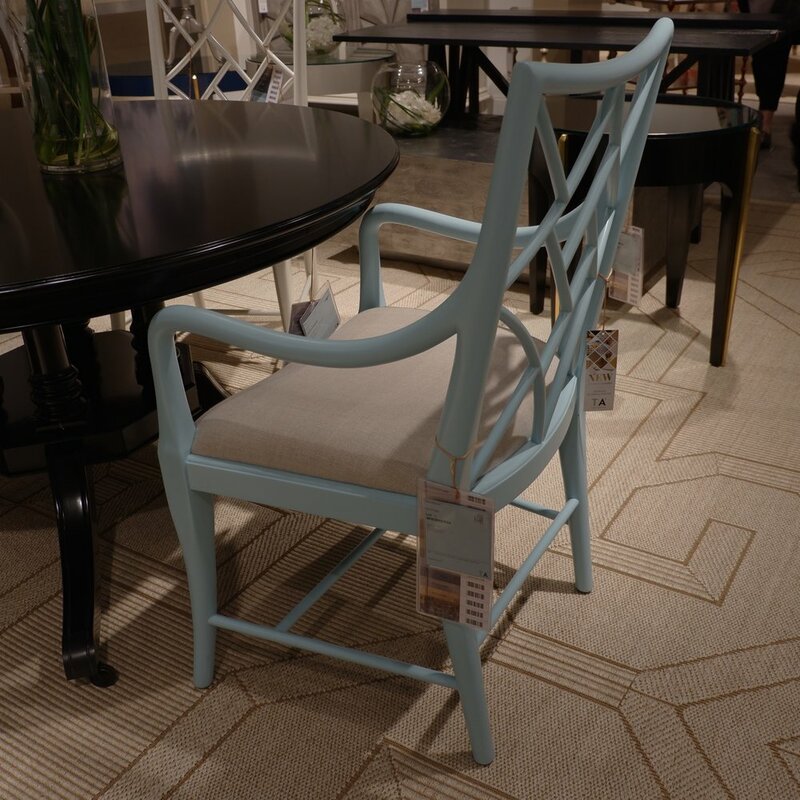 Our first stop is one of the biggest furniture players on the market, Bernhardt. Bernhardt is a go-to supplier with trend-forward designs and is available through my excellent clients at Cocoon Furnishings in Oakville. 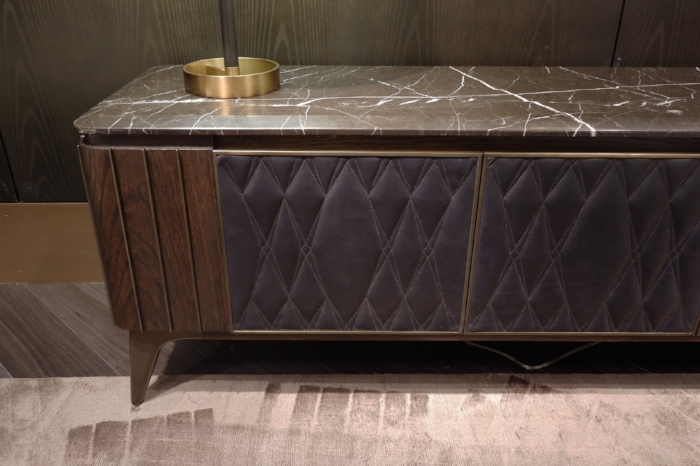 Despite the fact that the Bernhardt showroom is many thousands of square feet, with room after room of furniture, I'm going to call the little charmers in that photo above as the hit of the show for Bernhardt. 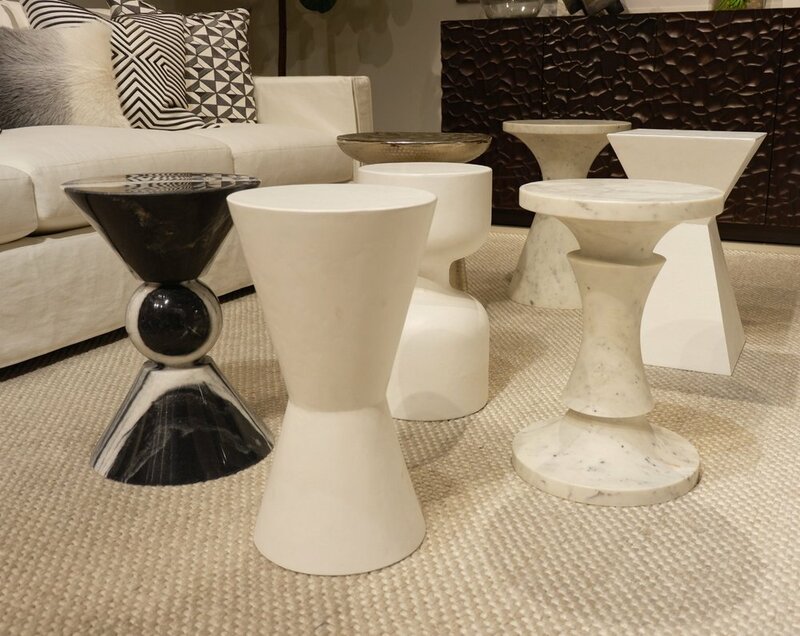 These shapely Drinks Tables in honed marble, metal and resin retail for between $395 and $1065US and can sidle up to any seat in any interior and hold your cocktail in fine style. That black marble one is Best in Show in my books. Bam! Also, note the clever showroom display which easily convinces visitors that they simply must have all of them! Well played art direction team at Bernhardt. I decided to opt for this supplied press image of Format, Berhardt's new seating collection because my shots of it in the showroom did not turn out well (blurgh). It happens. Market is packed with engaged professional buyers. When confronted with a sofa system that fills an entire room they do not hesitate to test drive it and linger (thereby ruining my photos). How could you not? Format is a modular system that includes five different pieces that can be combined in myriad ways to customize seating for your space. This is a major trend in sofa design right now and a significant part of an overall design industry trend toward customization. Every manufacturer at every price point has a modular system, from Living Divani's amazing Extrasoft to IKEA's Vallentuna. I particularly like this version of Format because of the military-surplus style upholstery fabric and monochromatic mix of solid accent cushions. Very chill. Organic is another buzzy trend word happening around High Point, and the Arbor bed was right on the mark with its faux bois form. Four-poster beds: still HOT and EVERYWHERE. Love. Them. Keeping up the faux bois, these étagères were quite lovely and the styling was on point! St. Bart's was the inspiration for much of the new Spring introductions, which explains the white-on-cream-on-ecru palette and hence why I liked so much of what I saw. Imagining a beach house outfitted as above. More highlights from Bernhardt: the Clarendon poster bed with burnished brass accents, the intricately inlaid Labyrinth chest, trend alert: the blue of these chairs — smokey blue!, a killer hair-on-hide chest, the sweetest tub chair in slubby open weave fabric with a faux bois silver-leafed frame and an interesting console from a collection mixing oak, leather and brass. The thing about the Bunny Williams Home collection is that it is an entire line of character pieces. Nothing goes with anything. And that's the point, so either decorate that way or pluck a beauty like Arabella out and pop it into the strictest modern minimalist powder room and then WOW! Even though Arabella is a showstopper, this was the sleeper hit of the whole booth in my books. This is the Harlow cashmere throw and it's an absolute dream of the finest cashmere and the sweetest ball fringe. (Pssst, Harlow retails for $1,800US). I knew I had great taste. If you'd like to see the main vignettes of the Bunny Williams Home booth just pop over to bunnywilliamshome.com. The site now opens with a slide show of professionally shot images from the booth, and as you click through the product categories all of the new items are indicated. Please come back here though! At Emporium Home we were greeted and given a tour by the owner and designer herself, Ashley Childers. Ashley's enthusiasm and passion for her design work was infectious! The collection she has designed is glamorous, but with a few notes of edginess to keep it modern. I loved the chunky cut quartz crystals and bold cabochon semi-precious stones used throughout the collection. She had me a malachite and amethyst. How amazing are those chandeliers that look like fireworks exploding!? Next stop for the design bloggers was the Badgley Mischka Home booth. To describe it I have one word in all caps: GLAMOUR. I have admit being somewhat surprised by the aesthetic. Of course it's obvious that Mark Badgely and James Mischka, creators of sparkly bodycon red carpet gowns and bridal fashion, are masters of glamour. But in past shelter mag editorials their interiors style has been more Country House than Hollywood. I've had this Badgely Mischka bedroom in my inspiration files forever. It's the look we are after at our home in Tweed, On. To be fair, this is actually a bedroom at a horse farm, so certainly not the setting for Hollywood glam interiors. 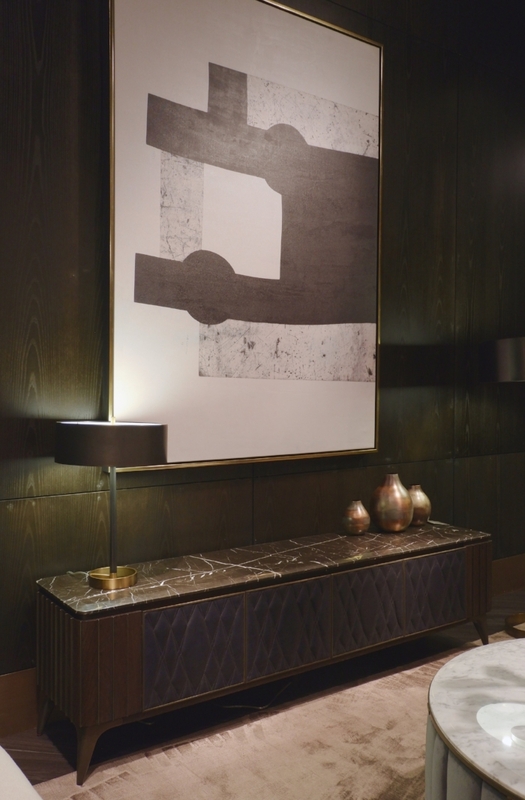 For their home launch the inspiration is definitely the left coast and the Golden Age of film and star-powered interiors. Loved the opportunity to meet the designers themselves and hear about their inspiration and the creation of the Monterey collection. There is certainly a celebrity factor with these two so the booth was PACKED, which made getting photos a challenge. I've peppered in a few supplied images so you can get a better feel for the collection. The pieces show two top trends I spotted at the show — gold leafing and the inclusion of design details on the back side of seating. 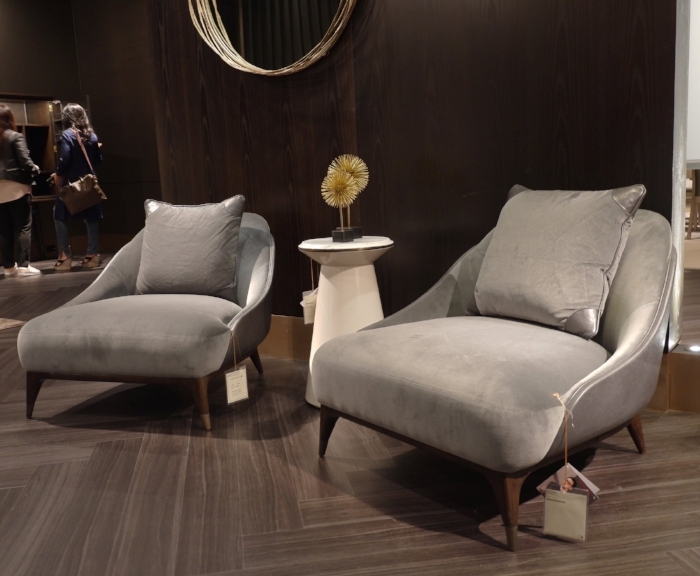 Nathan Anthony are experts in upholstered goods and they had many design and construction innovations on display. This Andrew sectional sofa above was an absolute charmer. I couldn't get a shot of the whole thing because there were people perched and draped over it constantly — ha! Proof of its amazingness. In a show jammed with thousands of sofas this one stood out for a few reasons. I love the wood plinth base — it's a design gesture I haven't seen before on a sofa. 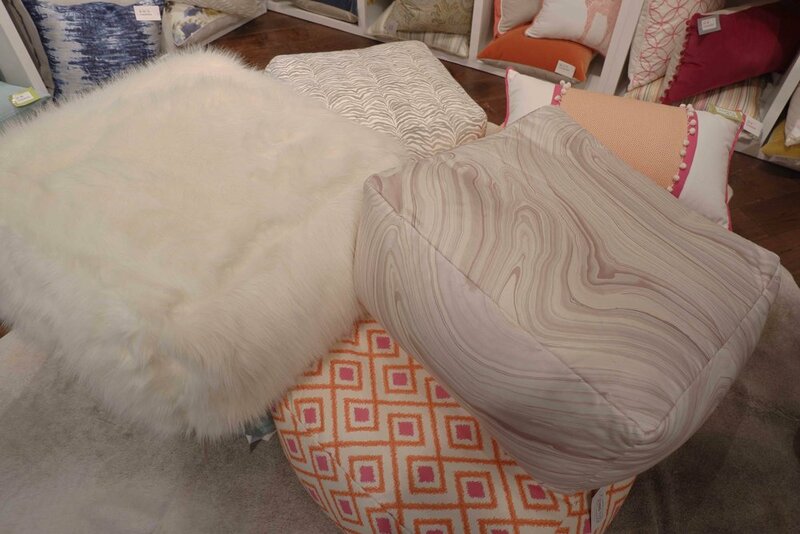 On many sofas the legs can be a design deal-breaker. The plinth is a great crowd pleaser — there's nothing to not like about it! Another trend-forward gesture on this piece is the fact that it lacks welting. Buh bye welting. I love the clean flat seams with no welting. Also love the low slung design and the fabric choice. This earthy, slubby, cross-hatched style of fabric was everywhere at High Point. Here's a glimpse at the other side of Andrew. Oh my goodness I do love him! Elsewhere throughout the booth, Nathan Anthony showcased it's talent (and the trend) for overstitching pattern onto upholstery, as well as a juicy colour palette and so. much. yummy. velvet! (Click each image above for a larger view.) The persimmon tub chair called Chelle was a major standout in the collection, with scalloped details around the back side and along the top line of the piece. The red velvet Grace bed and Minx wing sofa featured crisscross stitching inspired by London's Gherkin tower — clever! This hot ticket of a chair wasn't a High Point but it recently popped up on the Nathan Anthony Instagram feed and stopped me dead. Hello GORGEOUS — shape, colour, simplicity are all 100% on point. I adore it. Next stop was Huntington House. The showroom is massive with a heavy emphasis on comfortable custom seating. Without a doubt this daybed was my favourite piece in the showroom. Mr. Austin and I own three daybeds — we love them as a trim sofa alternative. This one has a streamlined silhouette so it will go in any style interior. Sometimes I'm fickle when it comes to matters of design. At Nathan Anthony the absence of welting endeared the Andrew sofa to me, but here it's the presence of welting that I appreciated. But it's not just any welting. This caramel leather trim combined with herringbone fabric was a winning combo in my books. 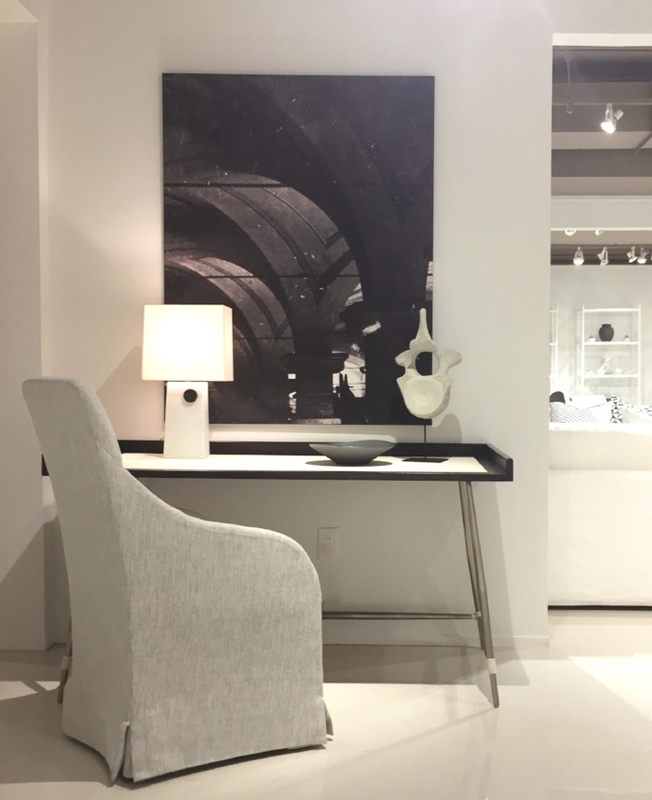 Some of the showrooms at High Point are done up to the nines with art and bold design ideas —and you will see some of that in my posts — but this vignette struck me for how low-key and REAL it looked. So welcoming. My goodness that chair is a looker and the colour absolutely makes it. Leather plus velvet plus linen with a fluffy carpet and a bit of green is dependable recipe for a crowd-pleasing family room. Speaking of inviting corners, check this out. 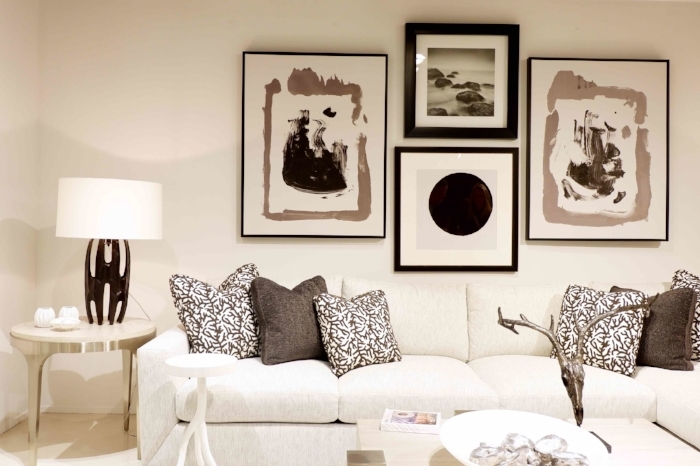 My fellow bloggers could not resist this cloud of a sectional from the Classic Casual Collection. What a dream! This collection allows you to choose from six arm styles and 20 different pieces to truly customize your seating. Here's the beauty without human accessories. Oooooh, so delish. Here's a chair from the collection featuring a rolled arm and skirt. If you follow me on the 'gram you may remember I posted this. It was truly massive and gives me all the Belgian minimalist feels that make my heart sing. Some more highlights from Huntington include the best giant coffee table I've ever seen, two handsome cabinets and velvet chairs to dream about. PSSST: brown is a thing and brown velvet specifically. Michael Berman's Califolio collection for Theodore Alexander. You've made it this far in the blog post. Congratulations and thank you! Now, go get another drink because there's still a lot to see (you realize I saw this all in ONE DAY, right?). Next up is the Theodore Alexander showroom. I knew them first as faithful reproducers of iconic designs from past eras. TA are the makers of the collection of pieces inspired by antiques from Althorp, family home of Diana, Princess of Wales. Also on the roster or design talents at TA are Leslie and Leigh Keno, my twin crushes of Antiques Roadshow fame. Alas, I did not lay eyes on Charles, the Early of Spenser or the Keno brothers during this visit. Nonetheless there was plenty of furniture design eye candy. The first collection on our showroom tour was this new custom casegoods grouping, which includes 200 pieces available in 25 colours and finishes. How fun to see all of the happy colours from TA, a company I sometime associate mostly with "brown" furniture! Pretty pretty. Next up was a stroll through the über-glamorous room sets furnished with pieces from the collaboration between TA and Jamie Drake. The designer himself was on hand to give us a guided tour. His inspiration is a mix of nature, Deco and Moderne. One felt the urge to sip champagne in a silk charmeuse gown in the presence of this furniture. Michael Berman's Califolio collection takes inspiration from California (obv) but with some details influenced by such diverse sources as Deco, '70s, Asia and even a touch of French Empire. Again the designer himself (above in bowtie) was on hand to lead us on a walk-through. If you can take your eyes off that magnificent tulip arrangement for a minute, please do note that lovely centre hall table with brass inlay. Here is a gallery below of more favourites. I thought the anamorphic shape coffee table and mirrors were wonderful and new looking. The latte brown of that velvet sofa is THE colour of the season according to moi. 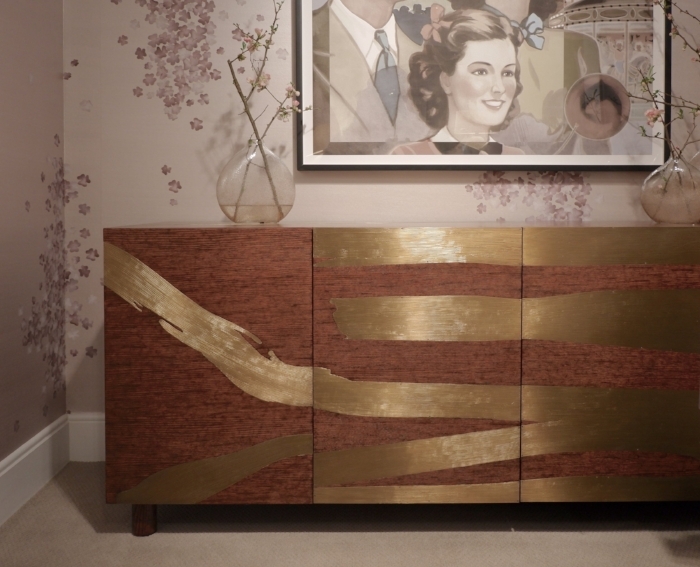 The circle motif on the Collins bedside table and credenza gave me some cool '70s vibes and the brushstroke design expressed in brass inlay on the Washi console was magic! You might expect attention spans to stray toward the end of a very packed day, but much to the contrary our visit to the Century Furniture showroom was positively energizing. There was just so much beauty to delight. It was not only a highlight of the day, but of the entire Market. I understand I have Century VP and Creative Director Ron Fiore to credit for much of my delight. The opening image is from the main central gallery of the showroom and it features pieces from all of the Century collections upholstered and styled in one giant dream sequence of palest pastel lilac with lots of creamy white and silvery greys. That's the merchandising vision of Ron Fiore. Fiore chose this fabric, Watercolor in Soft Lilac from the Miles Redd collection at Schumacher as a design anchor for the display. It was repeated on several pieces and served as the palette and mood setter. When I grow up I either want to be Ron Fiore, or work for him, or at least meet him. What an inspiration! As we made a left turn into the Windsor Smith gallery the pastel party continued. Wow. Her Alchemy collection introduced at this market is quintessential Windsor Smith. Her designs show clear influences of antique pieces, but then you notice a more streamlined silhouette or a Moroccan flourish or a touch of Hollywood glamour (there's that word again — trend alert!) and you now it's pure Windsor Smith. I was so pleased to learn that the collection will also be available through Cocoon Furnishings. Yay Cocoon! Enjoy a browse of some of the collection. Those last two shots feature the Firestone Sofa, which is based on a Federal piece Windsor once found. What an absolute stunner. 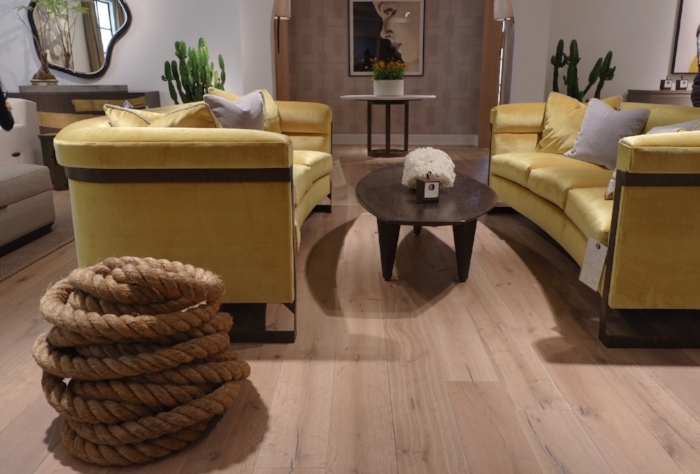 And in case you were wondering, that parquet flooring is the Couture collection by Windsor Smith for Jamie Beckwith. Thomas O'Brien (right) and his associate Keith Kancar at Century Furniture. The next collection we toured at Century was that of Thomas O'Brien. We were hustled through that area fairly quickly so I didn't get many shots, but I did enjoy a lovely chat with Thomas and his associate Keith, who were hard at work on the next collection. I couldn't help but photograph the tablescapes. Thomas's sense of layering a space with meaningful items is definitely in line with my own so I was very inspired by the tableau before me. Another highlight was seeing his shapely Jones chair upholstered in a delicious caramel-toned leather. That piece is a charmer! 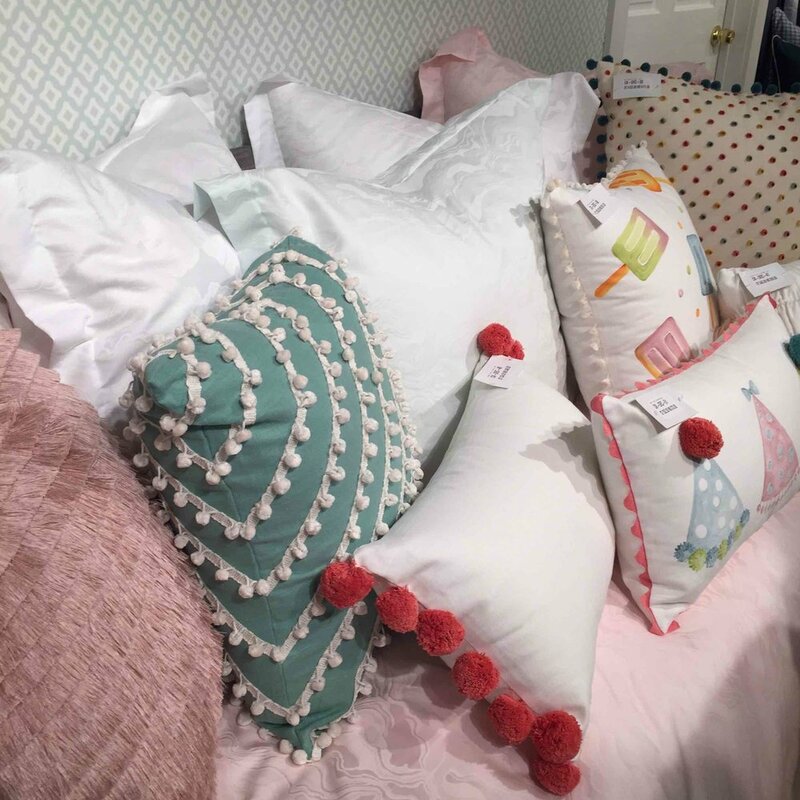 Fittingly the last stop on Day 1 at High Point Market was the Eastern Accents showroom filled to the brim with the fluffiest most luxurious looking beds. We all wanted to dive in! Luckily this happy elixir above was on hand to help unwind after the busy day. I have never seen sangria that with a warning before. It was delicious, as were all of the textiles in the booth! The biggest news at Eastern Accents is the new collab with NYC designer Celerie Kemble. Her collection (two images above) includes four ensembles: Budding Spring (pink stripes and animal print), Bramble (botanicals in neutrals), Midnight Poppy (monochromatic floral) , Pineapple Bobble (the collection shown above with a tropical beach house vibe), and Sweetness Mattelasse (an all-white collection). The line is a perfect reflection of her decorating look and offers so many ways to design a bed even from within one style group. My other favourites at EA included a sweet daybed covered in a bevvy of cushions embellished with my current trim of choice — ball fringe, the group of pouffs is many inviting fabrics and textures, and lastly, the pure linen collection, which can be customized with tape trim designs and monograms, or not — as you wish. Lovely. So, that's a wrap on Day 1 of the Design Bloggers Tour. Come back so you don't miss all the news from Day 2. plus a couple more bonus posts. Then you'll be up on all the latest design news and trends from High Point Market Spring 2017.